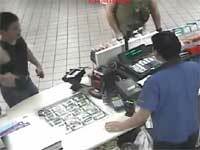 Drunk off-duty Tucson cop has been arrested and fired after pulling a gun on a gas station clerk. Submitted by monkey on Thu, 07/18/2013 - 2:14am. 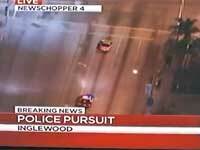 Last week Florence Police tried pulling someone over for traffic violations when it turns into a crazy highspeed chase. 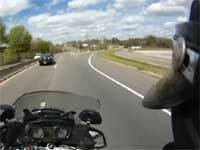 See it all through the motorcycle cops point-of-view. Submitted by monkey on Tue, 04/16/2013 - 12:33am. 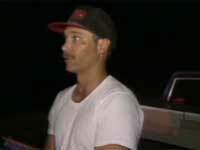 Clueless druggy gets caught in the act on COPS. Submitted by monkey on Tue, 04/16/2013 - 12:22am. German gets pulled over for speeding in the United States and gets a verbal smack down. Submitted by monkey on Wed, 04/10/2013 - 12:57am. Submitted by monkey on Thu, 01/17/2013 - 2:11am. 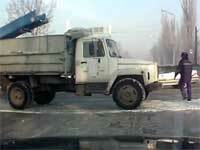 Russian Traffic Cop won't let anything stop him from doing his job. Submitted by monkey on Wed, 12/19/2012 - 1:15am. 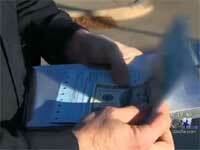 Imagine opening up a traffic ticket and discovering a $100 bill wrapped up inside. Check out this story.. Submitted by monkey on Tue, 12/18/2012 - 1:24am. Amazing cop has saved hundreds of people lives that went to the Golden Gate Bridge to jump. Submitted by monkey on Fri, 12/07/2012 - 12:51am. 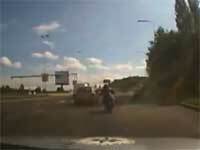 Police officer manages to catch up to and apprehend a runaway biker without any backup. Submitted by monkey on Tue, 11/13/2012 - 12:39am. 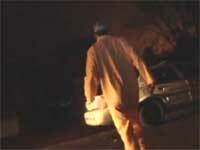 Idiot dressed up as a Ghostbuster does a backflip off a cop car, learns cops don't like when you do that.. Submitted by monkey on Thu, 11/01/2012 - 11:55pm.